Pantone recently released Fall 2016 color report, and they’re definitely not what you might expect. This year’s colors don’t rely on the traditional, muted fall hues that we’re used to. This palette is made up of warm-toned, bright colors you wouldn’t usually associate with the season, such as shades of blue. Here are a few ideas to help you incorporate these home color trends into your own home remodeling plan for the fall. For years, home color trends in the kitchen focused on clean, modern looks and crisp white cabinets. This fall, it’s time to turn that trend upside down. 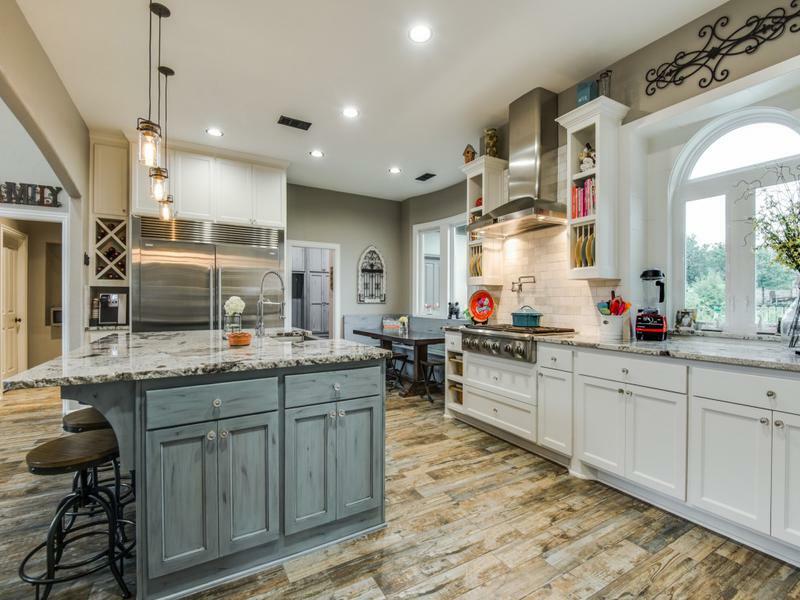 Not only are bold cabinet colors making a comeback, many homeowners are painting their upper and lower cabinets in complimentary or contrasting colors. This lets you play with fun colors without overwhelming the other design elements in your kitchen. The 70s are making a comeback in the fall home color trends, especially when it comes to printed patterns with a modern twist. Spicy Mustard, Aurora Red, and Potter’s Clay are some of the colors you’ll find this year. You can incorporate these prints just about anywhere in your home. From throw pillows to rugs and bedspreads, bold prints are going to be everywhere this season. These designs are also being included when people refurbish antique furniture or install tiling. Wallpaper is seeing resurgence in popularity, including using paper-backed fabric coverings on walls. Fall trends are directing everyone’s eyes up with large light fixtures. Chandeliers have been a long-time favorite, but dazzling and funky pendants are making a big appearance this year. Metal, wood, and neutral-colored light fixtures are almost always in style. For a bold change, this season’s light fixtures will be painted in unexpected colors like Bodacious, Airy Blue, and Aurora Red. Open concept rooms have been popular for a while, including big windows with white or light wood trim. This makes the outdoors feel like part of the indoors. This autumn, windows take a turn for the dark side as black window frames grow in popularity. The darkness of the trim contrasts magnificently with the natural light that comes in from the windows. Although this trend may sound a bit strange at first, once you see it for yourself, you’ll understand just how stunning these dark frames can be. With so many new home color trends this year, many people are choosing two-toned walls so they can include more of their favorite shades in one place. You can incorporate this subtly with darker and lighter variations of the same color or boldly using two extremely contrasting colors. One popular idea is a sponge painted gradient using the Pantone Colors of the Year, Rose Quartz and Serenity for an ethereal effect. Because this makes the walls a focal point in the room, choose neutral furnishings so your two-toned walls can shine. Are you ready to start planning your fall makeover? Take a look at our project photos for more ideas and inspiration.